The Empire Windowless Pent 5 X 3 Shed is a shed that really does capture your attention. With the lack of windows, you not only have a shed that is offering a lot of privacy, but the windowless look also gives it a very unique kind of style. The shed has a very smooth look, but thanks to this cladding that has been used, it is impossible for rain to find its way inside. A very good sized single door will make it so you do not have any trouble getting things in and out of the shed. That pent roof is designed to keep the rain from sitting on top and as it is angled towards the back it will not run off at the door. Some impressive materials have been used with this shed. The cladding is nice and thick tongue and groove cladding. 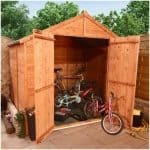 As the shed is pressure treated, you do not have to worry about rot or even having to treat the shed. The roof and floor have been made with solid sheet boarding which is much stronger than you would think. Overall the shed is very well made and it is going to give you many, many years of use. Now here is a very interesting shed. The lack of windows make the Empire Windowless Pent 5 X 3 Shed look like something that would be used to survive a zombie apocalypse! 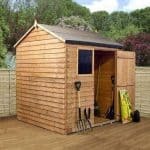 In all seriousness though, this is a very smart looking shed that is not quite as large as the pictures suggest. 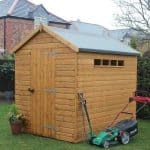 The width is 4 feet 9 inches with the depth being 2.9 inches so it is one of the smaller compact sized sheds we have seen. This though may be of benefit to many of you who want some storage space, but lack a large garden for a bigger shed. The floor space along with the 6 feet of head room, 5 feet 8 inches at the ridge mean you can make this storage space go a long way if you plan things out carefully. We really like the smooth pent roof they have used here. It is angled towards the back so the rain will not be running off where the door is, which is always something we like to see. The roof is made with solid sheet boarding and then covered with felt which at this price range is exactly what we would expect to see. The tongue and groove shiplap cladding they have used here is awesome. We really like the smooth look of it and love how there is no way for rain to get inside. They have not actually disclosed the thickness of the cladding, but here at WhatShed we have eagle eyes and to us it looks like 12 mm thick, which is the norm at this price range. Much like the cladding they have not said what kind of framing they have used, but when you look at the pictures, you can see that the Empire Windowless Pent 5 X 3 Shed has some solid framing inside it. This framing is going to keep the shed very solid, so you will likely find that it feels very robust. We are actually very pleased with the frame they have used and are sure it is going to be a main factor as to why you get so many years of use out of this shed. If you take a look at the floor, you will see that they have gone for solid sheet boarding for the floor. We really would have liked to have seen some tongue and groove boarding used, but that would have raised the price to over the £300 mark, so we are more than fine with solid sheet boarding being used. The biggest surprise of this shed was that the wood is pressure treated and tanalised. At this price that is a very good thing to see. Plus it takes away the need for you to get the brush and wood treatment out as it is ready to go from the moment it is installed. A ten year guarantee is given with this shed and that we feel is very fair. It in reality is going to last much longer than that and you do not have to worry about treating it to validate the warranty. A single door is located on one side of the shed. The door is well enough made and it fits in well with the overall style of the shed. We do like the three braces that have been put on the door which will make it feel strong. While the size of the door is ok, we do think that they could have put a set of double doors on here. There are no windows on the Empire Windowless Pent 5 X 3 Shed, but that is part of its charm. The lack of windows is the reason why we feel that they could have added a double door on the shed. 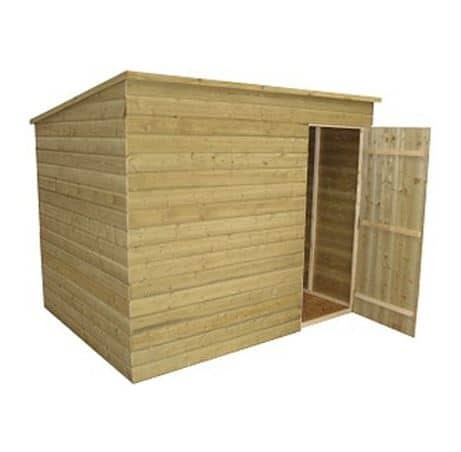 This is solid for a wooden shed and we feel that anything inside of here will be kept safe from the elements. But there is no included lock with this shed. There is just a turn button catch, so if you want to keep things securely locked up you will have to purchase some kind of locking mechanism. As there are no windows at all, you have a shed here that offers 100 percent privacy. This is fantastic if you plan on keeping expensive things inside of here or if you just want a place to hide from the wife and kids. We really like the wood they have used and feel that the shed has a great look to it, but if you do want to give it a little bit of colour then there are a number of different paints that are designed to help protect wood. That is the kind of paint we would suggest you go for, as while this is pressure treated you can never have too much protection from the elements. Two extras are on offer with the Empire Windowless Pent 5 X 3 Shed one of which is a Security Hasp and Padlock Set which at £4.99 is something we highly recommend you purchase as it will keep your things securely locked up. The other extra they have is very weird – it is a Suncast Golf Storage Organiser which is one of the oddest extras we have ever seen. Despite them claiming this is an “essential extra”, we would suggest you pass. 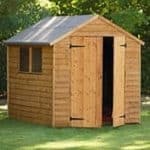 We are impressed with this shed and while the floor and roof are not as high quality as the rest of it, for under £300 we are happy with the overall quality. This is going to give you plenty of years of use. They have used some good wood here. Plus the fact it has been pressure treated means that it is set up to take anything the weather throws at it. This is actually a little under 5 X 3, so you will have to make sure you place things in an orderly way to get the most out of the space it offers. As far as wooden sheds go this is pretty straightforward. Just make sure you have a friend to help you out and you will be done in around 4 hours or so. The asking price here on one hand is very fair. It is made with pressure treated wood which is great. Plus the overall design does have a very classy kind of look to it. Final Thoughts: With its windowless look the Empire Windowless Pent 5 X 3 Shed is a shed that certainly does capture your attention the first time you see it. We are sure that many people will love the design of this shed. As well as being easy on the eyes though, that nice and thick pressure treated tongue and groove shiplap cladding makes the shed able to handle even the harshest winters. Plus as an added bonus, you do not have to waste your time or ruin your good jeans by treating the shed yourself. 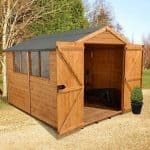 The size is compact, but if you are looking at this then you are clearly in the market for a shed that does not take up much space. Which this one does not. 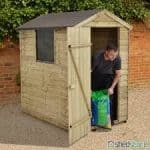 In all this is a solid and well made shed that we feel is ideal for those short on space and who do not want to spend a fortune.